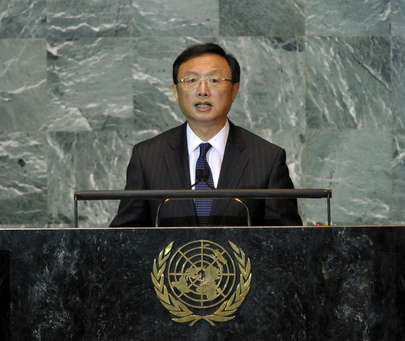 YANG JIECHI, Minister of Foreign Affairs of China, said “the world has entered an extraordinary historical stage in its pursuit of peace and development”, noting that global development was now at a new juncture. The gap between the South and the North was as wide as ever. Nearly 1 billion people suffered from starvation and it was vital to step up cooperation to help meet the needs of the least developed countries. In the face of such challenges, ensuring security through cooperation and promoting development through stability had become a shared desire. He urged working “as a team” to overcome difficulties and pursue both mutual benefit and common development. To fulfil that mission, global economic recovery must be fostered, he said. It was important to work for a fair, just, inclusive and orderly international monetary and financial system and increase the voice of emerging markets and developing nations. He supported the transition of the Group of 20 from a short-term crisis response mechanism to a long-term instrument of economic governance. He also strongly opposed protectionism and called for strengthening the multilateral trading regime. It was also important to lay the political foundation for cooperative development, he said, stressing that the equal right to development must be protected. It was vital to adhere to the United Nations Charter, uphold the United Nations’ authority, observe the principle of non-interference in internal affairs and promote democracy in international relations. The sovereignty and territorial integrity of all nations should be respected, and he opposed interference in States’ internal affairs. The development path of each country should be respected. Next, a security environment conducive to stability and development should be fostered. China respected the independent choices of the people of Sudan and South Sudan, and had worked to advance the peace process between them. China also supported proper settlement of the Darfur issue. On the Middle East, China supported efforts to achieve the “two-State solution” through political negotiations to establish an independent Palestinian State, he said. In parallel, progress should be made in peace talks between Syria and Israel, and between Lebanon and Israel. He voiced great concern at turbulence in West Asia and North Africa, saying China stood for the principle of non-interference, respect and support for countries in independently handling their internal affairs. On Libya, China respected the choice of Libyans and recognized the National Transitional Council as the governing authority. In Syria, he urged parties to exercise restraint and avoid further bloodshed. A Syria-led, inclusive political process aimed at promoting reform was the right way to resolve the crisis. Elsewhere, he said dialogue and consultation were the only effective ways to address issues on the Korean peninsula. The Six Party Talks were an effective way to advance denuclearization of that area. He welcomed the resumed dialogue between the Democratic People’s Republic of Korea and the Republic of Korea. Finally, he said balanced development between the global South and global North should be promoted. In the Horn of Africa, he called on States to scale up assistance, stabilize food and commodity prices and help countries enhance capacity for self-development. Developed countries should honour pledges for official development assistance, open markets and debt cancellations, while developing nations should explore growth models conducive to development and poverty alleviation. Noting that China’s development had become an international focus, he said China had become the world’s second-largest economy, exporter and importer. It was the largest emerging market. On the other hand, it was a developing country with a large population and weak economic foundation. It was committed to enhancing mutually beneficial cooperation based on equality with other developing countries. As China continued to develop, it would create more opportunities for world peace, development and cooperation.